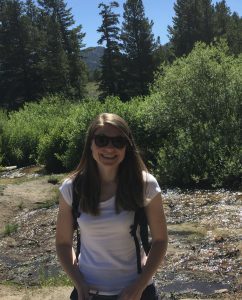 Welcome to Archives & Special Collections, Molly! Join us as we celebrate the arrival of Molly Campbell, the new Digital Archivist! I took a little time to interview our newest addition to the team to introduce her to Around the D.
You’re just beginning to get to know Davidson’s Archives & Special Collections–what’s your background in archival work? I first became interested in archives when I was an undergraduate student studying public history at James Madison University. I was lucky enough at that time to acquire a summer internship at the Hagley Museum and Library in Wilmington, DE. Over the course of that summer I really fell in love with archives and decided to pursue a MA in History to further my knowledge of the field. Once I had obtained my MA from the University of Massachusetts, Amherst it was fairly apparent that I was also going to need a Master in Library Science (MLS) in order to better understand archives, so I did just that at the University of Maryland, College Park. After graduation I worked in the archives of The Lawrenceville School, which is a boarding school in Lawrenceville, NJ. At Lawrenceville I had the chance to work on a number of exciting projects, including working with students and faculty. What about the Digital Archivist position interested you? The position interested me for a number of reasons. I think initially the title “Digital Archivist” attracted me because I am particularly interested in working with and managing electronic records. Thanks to the proliferation of digital technology our society is producing a massive amount of data that archivists are trying to collect, organize, preserve, and make accessible. I want to be part of that movement to preserve digital records and this will be a fantastic opportunity to do just that. Davidson is currently producing a large amount of digital material and I hope that I can help collect that information so future students, faculty, and staff can easily access it. I am also excited to make our print and a/v collections more easily accessible through digitization initiatives. Are there any projects you’re particularly passionate about introducing to Davidson? I have a number of ideas relating to projects that I think would be exciting to introduce to Davidson, but for the time being I am going to try and better understand what this particular community values and how the Archives & Special Collections can better serve it. I would really like to take the time to learn how people currently utilize the materials in Archives & Special Collections to see what projects would best serve our userbase. 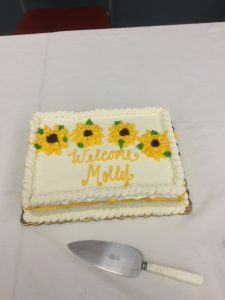 A welcome party was held in the Library for Molly on Wednesday, April 4! You haven’t been here long yet, but what has been your most memorable or surprising experience at Davidson thus far? I was pleasantly surprised how welcoming everyone has been since I arrived. The most memorable experience thus far was when a group of the Library staff surprised me with a welcome song set to the tune of “Hello, Dolly.” It was great and certainly very memorable! What are three things you want Davidson’s community to know about you? More than anything else I would like the community to know that I am excited to be here and am ready to hit the ground running! I am excited to begin meeting students, staff, and faculty across campus and would like to hear how they envision Archives & Special Collections best serving them. Please feel free to drop me a line anytime! Photograph of desecrated tombstone of Enoch Donaldson from earlier this month. 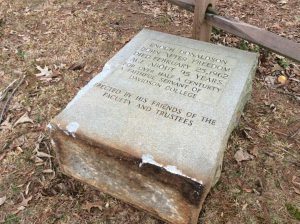 On Wednesday, March 7th a currently unidentified reckless driver speeding through Davidson at twice the posted speed limit was found to have damaged headstones at the Christian Aid Society Cemetery on Ridge Road. The Christian Aid Society was founded as a group of black churches in Davidson in 1905 and the cemetery was originally a designated resting place for Davidson’s black community. Although not owned by the college, the Christian Aid Society Cemetery can be found just beyond the baseball field. 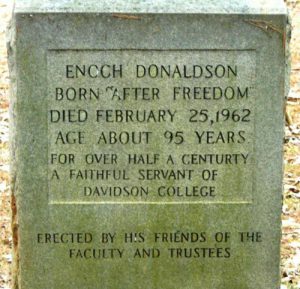 Among those whose headstones were desecrated by the reckless driver was Mr. Enoch Donaldson, a man who served Davidson College for decades during the early to mid-twentieth century eventually becoming “Dean of Janitors.” Donaldson was born after the Emancipation Proclamation marked the start of the abolition of slavery. Although the exact date of Donaldson’s birth is unknown, he was born in 1867 according to his death certificate. He passed away at the age of approximately 95 on February 25, 1962. Throughout Donaldson’s lifetime of service to Davidson College, the town and the institution examined and changed racist policies. According to the 1870 census, only 630 of the 1,605 residents of the town of Davidson were black. 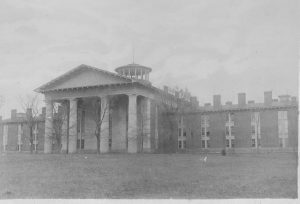 During his early childhood, in 1875, Davidson College students were granted the requests made in a petition to “keep out of the College all colored persons to whom express permissions had not been given to enter or labor there.” The only exceptions were those who attended church on campus and two men, Jim Burton and George Wilson, who were employed as laborers. 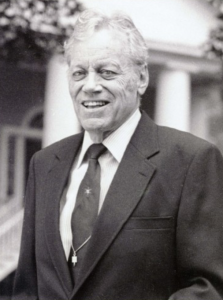 Towards the end of his life, campus conversations regarding integration and civil rights became increasingly accepting of interracial connections. In the 1950s, Louis Armstrong performed at the college three times and Otis Redding visited once to perform in 1961. In February 1961, a year prior to Donaldson’s death, the Board of Trustees voted to integrate the college, a decision which was poorly received by the majority of students and local residents. Unfortunately, Mr. Enoch Donaldson did not live to see the campus’ welcome to Ben Nzengu, the student who broke the color barrier, in the fall of 1962. The life of Mr. Enoch Donaldson offers unique perspective and appreciation of the black slaves and laborers whose tireless, lifelong efforts built the foundation of Davidson College. Those curious to learn more about Mr. Donaldson’s life can read his story here: Born after Freedom. The maintenance of the Christian Aid Society and its cemetery is integral to the preservation of the legacy of black existence and influence in the Davidson community. The Society is in need of contributions to aid restoration of the historic burial site. Those interested in contributing may write a check to the Christian Aid Society and mail it to Davidson Christian Aid Society, PO Box 1323, Davidson NC 28036. Library Directors of the Past, Present, and Future: Welcome Lisa Forrest! 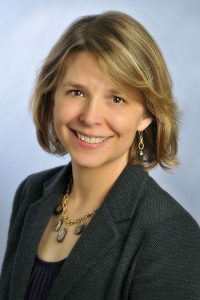 On July 1, Lisa Forrest of Hamilton College will become the second Leland M. Park Director of the Library and Davidson College’s fifth Library Director since its founding in 1837. Forrest’s career prior to Davidson includes service as the director of research and instructional design for Hamilton College’s Burke Library and as an associate librarian at SUNY Buffalo’s E.H. Butler Library. Ms. Forrest has been honored with the Excellence in Library Service Award from the Western New York Library Resources Council and as a fellow of the EDUCAUSE Leading Change Institute. As Davidson College and other elite institutions of higher learning explore the future of facilities built around books in the digital era, Forrest’s expertise in both traditional and experimental models of teaching, learning, and research in the liberal arts will be of great service. The Library Director position was inaugurated by Cornelia Rebekah Shaw, who was elected “Librarian and Registrar at a salary of $900.00 per annum” on May 28, 1907. Shaw’s twenty-nine year career on campus was notable in many respects–she was the college’s first woman employee, first librarian, first registrar, and first secretary to the President. She was well respected by all on campus and her hospitable service to the library made her well-known as every student’s best friend. 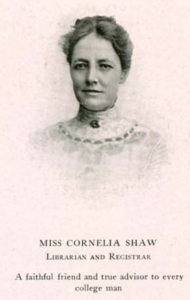 In fact, the college yearbook Quips and Cranks, was dedicated to Miss Shaw in 1912. During her time, Shaw oversaw the movement of the library’s collection of little more than 10,000 volumes from the “Union Library” room in Chambers to the Carnegie Library, which has served as a guest house since 1942. Shaw’s history of the school, Davidson College, was published in 1923 with a foreword from College President Henry Louis Smith (1901-1912) and can be found in the Davidson College Special Collections. Following Miss Shaw’s retirement in 1936, Davidson College’s longest serving Library Director began service: Chalmers Gaston Davidson ’28. Affectionately known across campus as “Dr. D,” Davidson was the college’s first professional librarian, he earned his Master’s in Library Science from the University of Chicago in 1936. When Dr. D’s career began, the library was very small and not the hub of student life as it is known today. The collection was a mere 39,000 volumes, the annual materials budget was $3,500, and there was only one other employee: assistant librarian, Miss Julia Passmore. However, barring the years Dr. Henry Lilly took over the position whilst Davidson served in WWII, Davidson revolutionized the library space, including overseeing the move to the Grey Memorial Library in 1941. Not only was Davidson also a member of the college History department, but by 1961, he had grown the annual library budget to $41,000. Perhaps Dr. D’s success was in his blood, given that he was a direct descendant of William Lee Davidson, the college’s namesake. Leland M. Park ’63, 1975-2006. 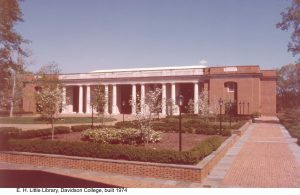 The 1974-1975 school year brought much change to the Davidson library: Dr. D retired, Leland M. Park ’63 became the new Library Director, and the E.H. Little Library was dedicated in September of 1974. Park earned his Library Sciences degrees from Emory University and Florida State University before serving as Library Director for 31 years. 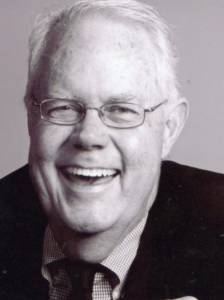 At his retirement in 2006, the Quips and Cranks yearbook staff elected to dedicate their volume to Park and his service to the school and the Library Director position was named in his honor. In 2007, Gillian Gremmels was named the first Leland M. Park Director of the Library. Unlike her predecessors, Gremmels was neither an alum of the college nor a long-time resident of the area. Gremmels was raised by two professors on the campus Iowa’s Wartburg College, is a descendant of Wartburg’s founder, and continued on to attend the school and act as their Library Director. 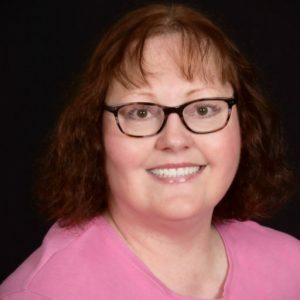 Although currently on sabbatical from the mentoring seminar faculty of the Association of College and Research Libraries and after serving Davidson College for ten years, Jill Gremmels will serve the Dean of Cowles Library at Drake University in Des Moines, Iowa beginning on July 1. In yesterday’s issue of the campus newspaper, The Davidsonian, an article by Emma Brentjens ’21 profiled the two women behind the school’s yearbook–Quips and Cranks. Mariah Clarke ‘18 and Hayley Atkins ‘18 are currently co-Editors-in-Chief of the 123 year-old publication. The Quips and Cranks was founded in 1895 and, according to College Archivist DebbieLee Landi, the yearbook originally served as a creative outlet for students, becoming the second campus publication of student work and interests beyond the Davidson Monthly. Since 1895, Quips and Cranks has connected students, archivists and alumni with Davidson College’s past. Quips and Cranks 1895, volume I. 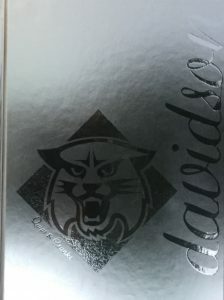 While most members of the Davidson community are more than familiar with the college yearbook, Quips and Cranks, they may be less familiar with the origins of its title. The title comes from a line of Milton’s poem L’Allegro as published in his 1645 anthology, Poems. The poem is a companion to another Milton piece, Il Penseroso. As Jennifer Hickey and Thomas H. Luxon of the John Milton Reading Room at Dartmouth College describe the pairing, “l’allegro is the “happy person who spends an idealized day in the country as a festive evening in the city, il penseroso is “the thoughtful person” whose night is filled with meditative walking in the woods and hours of study in a ‘lonely Towr’.” The poem puts at odds the sensations of mirth and melancholy through the perspectives of a man enjoying the wonders of nature in the countryside and vibrant city life. Here, Milton is idolizing the joys the nature brings to one who walks within it, such joys indeed are also brought to the students of Davidson College by one another. 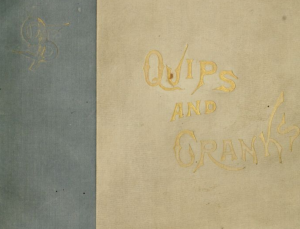 For those who seek to share some of that joy, digitized copies of the Quips and Cranks dating back to the 1895 edition and as recent as 2011 can be found on the Davidson College Archives & Special Collections website. Quips and Cranks 2017, volume CXIV. The full version of L’Allegro can be found here. 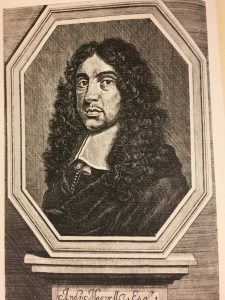 The John Milton Reading Room article on L’Allegro can be found here. The article from The Davidsonian can be founds here. Last month, Davidson College made headlines when Kiplinger’s 2018 Best College Values report revealed that it had been ranked as the liberal arts institution of the highest overall value in the country and the second best overall value in higher education, following Princeton University. 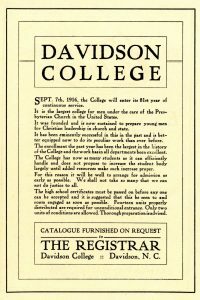 Looking back in Davidson’s history, College advertisements boasted the College’s curriculum geared toward Christian leadership, the connection to the Presbyterian Church, the outstanding faculty and available athletic facilities. The College Archives & Special Collections features two newspaper advertisements for the College from the turn of the 20th century, unfortunately, their specific publication dates are unknown. Do you have any advertisements from Davidson’s history? A walk down memory lane on Davidson’s campus offered Chip Davis, a Davidson native and one of the first to use a computer on this campus, a unique opportunity to share his story. A student working with the IBM 1620. Chip Davis was born a year to the day that his father, William A. Davis (Class of 1950) graduated from Davidson College. His father went on to assume responsibility for the College Infirmary and growing up, Chip came to know many of the faculty as friends and neighbors. Today, he is (mostly) retired from a career work with programmers on mainframe computer systems and then training future programs. 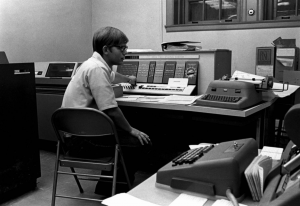 He was first introduced to computer programming on Davidson’s campus during his teenage years. 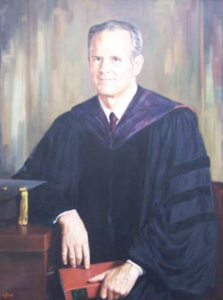 David Grier Martin served as the Davidson College Treasurer from 1951-1958 and as College President from 1958-1968. In a memo to the faculty in October of 1962, College President David Grier Martin announced that the College would be renting an IBM 1620 computer on a trial basis. Davidson was going to throw its hat in the ring with a first attempt to use computers for educational and research purposes.In 1962, Dr. Locke taught an hour-long non-credit programming course. In the following years, only a few classes used the computer at all: Psychology 71: Advanced Experimental Psychology in 1963 and Applied Math 11: Introduction to Digital Computers in 1964. “One day in the winter of 1963, Dr. Bryan took me down to see the freshly installed computer in Chambers. 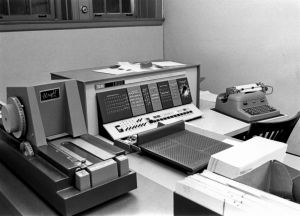 It consisted of the 1620 Central Processing Unity and the 1622 Card Reader/Punch. The 1311 Disk Drive would come later, which meant that there was no file system on which to store programs, so you punched out a deck of cards instead. I wrote quite a few utility routines in machine language in those early days, mostly to make things easier for the ‘real’ programmers: professors and students who were using FORTRAN to solve problems in math or physics. Not everything I wrote for the 1620 was serious. One program created and printed out an image of the Jolly Green Giant to give to one of my favorite teachers. Spaces for technological innovation and exploration like Chip Davis’ exists still on this campus. Studio M offers students a center to learn the new cutting edge technologies, such as 3-D printing and laser cutting. Additionally, in 2017, the Hub@Davidson was created to foster a community around technology, innovation and entrepreneurship in the Lake Norman area. 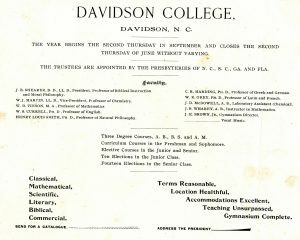 Between 1871 and 1877, Davidson College was without a president. The College was not, however, lacking in leadership. Following President George Wilson McPhail’s death in 1871, the Board of Trustees decided to replace the role of president with a chairman. The new role was assumed by Professor John Rennie Blake (1825-1900) from Greenwood, South Carolina. Professor Blake was educated at the University of Georgia and Harvard University’s Lawrence Scientific School. Prior to his election as a professor of Natural Philosophy in 1861, Professor Blake also served as an educator at the Presbyterian Female School in Georgia and LaGrange Synodical College in Tennessee. Although governing a college during post-civil war reconstruction was no easy feat, Davidson produced two notable alumni under Professor Blake: Woodrow Wilson (attending from 1873-1874) and Robert Broadnax Glenn (class of 1875) who went on to be the first Davidson alum elected governor of North Carolina. Unfortunately for Professor Blake, the Board of Trustees moved to reinstate the office of the president to the college in 1877 and, not being ordained by the Presbyterian Church, Blake was ineligible for presidency. However, he remained on campus acting as the College’s Vice-President and teaching astronomy and natural philosophy courses until resigning in 1885. 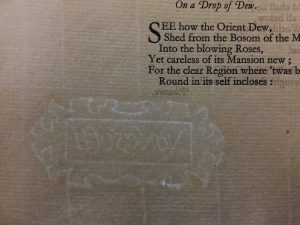 The Davidson College Archives holds a document by Professor Blake with a remarkably clear watermark and a reflection on the importance of classic poetry, transcribed below. We would fain survey the unfading laurels won by the Poets tunefull [sic] hands. And who merites [sic] more the praise and love of man? They enhance the glories of worthy, and the depravities of the aricious [sic]. They beat the strains gentle yet startling which the wourld [sic] hears and bending listens with alternate ebbs and flows of soul as glory, or crime is the burden of the song. He may not now—as once—like the schrill [sic] tones of the clarion call to battle but he can breath a melody that will come upon the troubled heart “like an angel’s whisper.” We “brings fresh showers to the fainting flowers.” The stern realities of life melt by the soft touch of his magic wound with his sweets that sink into the inmost heart. He creates “pure fountains of thought” whose cooling waters “change the barren desert of the heart into a green oasis, as reviving to the troubled soul, as the breath to the fevered brow. The tears of bitterness, the sighs of woe—the greifs [sic] an cares that embitter the young heart—die silently away before the magic influence of the poet. Who can tell the genial flow of soul, the fervent gushings of feeling, and the divings of thought into thoughs [sic] boundless sea to bring to light some “precious pearl of truth,” that have been incited by such gifted minds, and eloquent tongues. What patriot amid the general rejoicings and the glory of his country does not see that glory enhanced and illuminated by the shining literary lights that start its skies. Supose [sic] that the sacred scroll bearing the gilded, and emblazoning names of Shakespeare, Milton, Biron [sic], and many others, should be cast into the fountain of oblivion. Is that would then harmonize the discordant elements that would then rime [sic] throughout Old Europe. Around what human after could mankind then bow in common and mutual veneration But thanks to the age those names can never perish. What lights in the distance “which lends an enhancement to the view” would then shine upon the path of the solitary scholar to pilot him to the temple of fame. The influence of the tryumphs [sic] of poetry are coexistent with time. In conclusion I will give an example of genuine poetry which cannot fail to touch the coldest heart. Did you know that the E.H. Little Library is not the first building to house the college’s library collections? In fact, there were three before it. The first physical space to house the book collections of the college, was in the Library Hall in “Old Chambers,” the building which burned in 1921 and was replaced with “New Chambers,” the building on campus today. The first building to be built on campus as a library was the Carnegie Library, completed in 1910. 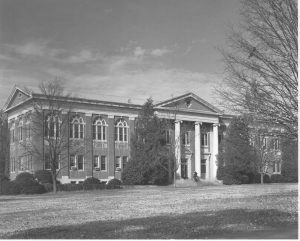 In 1941, the second library building opened, the Hugh A. and Jane Grey Memorial Library. And, our present library building, the E.H. Little Library, was completed in 1974. That doesn’t mean that the former library buildings are no longer here. 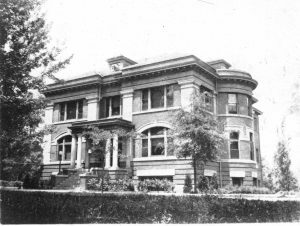 Carnegie is now the Carnegie Guest House, and Grey became the student union for a time and is now the Sloan Music Center. If you’re around, come by the library after the new year and see the display in the Rare Book Room with pictures of the libraries and some of the books from the original collections. A hallmark of good research is looking beyond the surface. Particularly, in the Davidson Archives, it is prudent to search beyond what meets the eye—literally. The Davidson College Archives and Special Collections houses a multitude of rare books and 19th century correspondences by former College Presidents which boast watermarks. Such hidden images on the pages can offer insights as to where and by whom the paper was made, as well as its quality. Nonesuch Press watermark and chain and laid lines visible on handmade page. The tradition of watermarks in papermaking began in Fabriano, Italy late in the 13th Century and was continued by other manufacturers of handmade paper into the 19th century. Watermarks were formed by twisting thin wires into various geometric shapes and adhered to the paper mold. The mold was simply a wood-framed wire screen which would be dipped into a “soup”-of-sorts of warm water and rag fibres several times. As the water strained through, horizontal (laid) lines and vertical (chain) lines would appear on the forming sheet. The shape of the watermark was imprinted into the sheet whilst the fibres were still wet, thereby thinning the paper in a specific area, forming the mark. 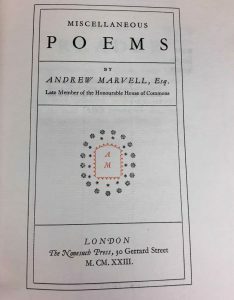 The Davidson Rare Book Room holds a 1923 reprint by The Nonesuch Press of the Poems of Andrew Marvell, the original 1681 edition of which is housed in the British Museum. As noted on the cover, the edition was printed on handmade Italian watermarked paper. The Sparrow’s Nest, unknown year. This past July, although activity had slowed down around campus for the summer, a renovation crew discovered that there was much of interest below ground. Specifically, beneath the Sparrow’s Nest. At first glance, the Sparrow’s Nest does not look like much. It is a small, brick cottage nestled between Belk Hall and Vail Commons, across from the Lula Bell Houston Laundry. During the school year, any glimpse of activity in or around the building. To the untrained eye, the Sparrow’s Nest appears to be unused, perhaps simply a storage room. However, the history of the Sparrow’s Nest reveals there is much to be learned about its history with reference to Davidson College and the town of Davidson itself. During renovations in July, Barbara Benson, Director of Building Services, and David Holthouser, Director of Facilities and Engineering, informed the College Archives & Special Collections that the crew found more than the expected decay of an old building. Whilst removing the termite-damaged floor system, the renovation crew from Physical Plant discovered a myriad of artifacts from former inhabitants of the Sparrow’s Nest. Currently, the building is used as a Physical Plant facility. Prior, the Sparrow’s Nest served as a Campus Security Office from 1974 to 1990. It was acquired by the College in 1908 and continued to serve as a boarding house for some time after its acquisition. The shoes. 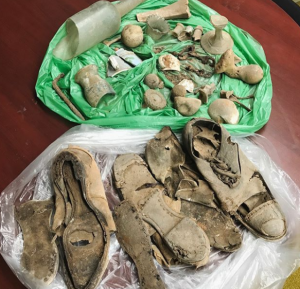 bones, and personal belongings found beneath the floor of the Sparrow’s Nest in July. 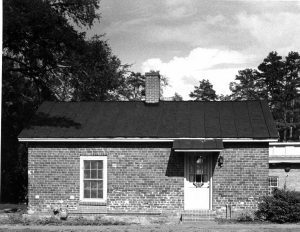 The house originally served as slave/servants’ quarters for Thomas Williams Sparrow (1814-1890.) 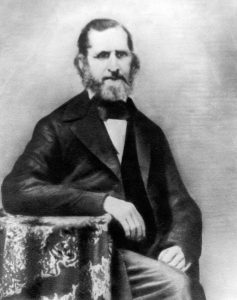 Thomas was brother to College co-founder Patrick Jones Sparrow, who taught Ancient Languages at the College from 1837 to 1840. Thomas W. Sparrow married Martha Lucinda Stewart (1820-1905) and together the two ran a boarding house for the college students in a house on North Main Street. In the May 1912 edition of D.C. Magazine entitled “Memories of the Fifties,” J.J. Stringfellow from the Class of 1850 recalls that the Sparrows were nicknamed “Uncle Tom” and “Aunt Tom” by students. Stringfellow describes them as “always kind in treatment and generous at table” and continues to compliment their hospitality saying, “No boy of that olden time can ever forget their famous molasses pies.” Thomas Sparrow is buried in the Davidson College cemetery. As for the children of Thomas and Martha Sparrow, their daughter Helen married J. Wilson McKay, D.D. from the Class of 1870. He went on to be the president of the Board of Trustees for some time. 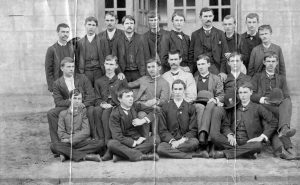 Their son, John Sparrow (1845- October 30, 1883) was a bit of a troublemaker and was eventually expelled from Davidson College. In 1866, John Sparrow eloped with Helen Kirkpatrick (1847-1900), the daughter of the College President of the time, John Lycan Kirkpatrick. John and Nellie had seven children. Their four daughters were named Anna, Marry, Mattie, and Nellie; the latter married Wilson McKay, the son of Dr. McKay who had been President of the Board of Trustees. John and Nellie also had three sons: Robert Gordon, Thomas Hill, and John Kirkpatrick Sparrow. Although Thomas Hill Sparrow did not attend college at all, his two brothers did. John Kirkpatrick Sparrow was a member of the Davidson Class of 1901 but did not graduate. Notably, Robert Gordon Sparrow was the Valedictorian of the Class of 1888 and long-held the record for the highest grades ever received at Davidson College. The Class of 1888. Robert Sparrow is pictured second from the left, seated in the first row. There is great evidence of the Sparrows’ slaveholding practice. In an essay entitled “My Unreconstructed Grandmother” by Mary Sparrow Harrison, she describes the attitudes and experiences of her grandmother, Martha Lucinda Stewart Sparrow. Mary remembers Martha as a distant, unaffectionate grandmother who was proud, yet hardened by her Southern heritage. According to Mary, Lincoln’s name was never mentioned in their household but that former slaves continued to visit her grandparents annually for years after the Southern “surrender.” Following the death of John Kirkpatrick Sparrow, Mary’s father, a former slave traveled from South Carolina to grieve with “Miss Martha.” According to Mary, he had been a wedding gift from College President John Lycan Kirkpatrick to Martha. 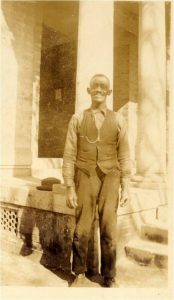 Mary writes that the older gentleman had accompanied her father during childhood, young-adulthood and even during when he joined the army in 1862. Of the relationship between this man and her family, Mary writes, ” I do not know how long he stayed with the family after the end of the war or where he went or how he knew that “Miss Martha” need him that day, but I do know that the meeting between those two—the proud reserved women and the ex-slave and friend who had learned of her sorrow and had come to comfort her left an indelible impression on my child-mind.” Perhaps the artifacts discovered beneath the Sparrow’s Nest holds answers as to that gentleman’s identity and his experiences being enslaved and freed by the Kirkpatrick-Sparrow family. In order to continue following the story of the Sparrow’s Nest’s purpose throughout the centuries, follow the blog-tag: “Sparrow” or the hashtag: “DavidsonHistoryMystery” on Instagram and Twitter.